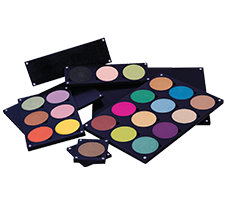 This Avas cosmetics's blusher palette is Dermatologically and Ophthalmologically tested & is paraben and mineral oil free. Create a perfect dramatic make up with this complete blush palette which is crease-proof, and smear-proof. With Avas blush brush apply it lightly over cheeks in light upward feather strokes. Blend well for a soft natural shadowy effect with the blending brush.